On a new course, a new record is expected Saturday during a showdown between the top distance runners from Antigua and Barbuda, St. Thomas, St. Martin and the BVI, in the 13thOgier-Deloitte BVI Sunrise Half Marathon. Runners will race over a looped course starting at 6 a.m., from the Tortola Sports Club in Pasea, meandering to the turnaround in Manuel Reef, for two laps of the 13.1 miles footrace. Final registration which costs $70, will take place between 5 and 7 p.m. on Friday at the Tortola Sports Club. After tearing up the local road racing scene and establishing records during the 2 Miles, 5K and 10K races, Clif Struiken, said he’s looking forward to his debut. “I can’t wait to race the guys from Antigua, St. Thomas and the BVI talent this Saturday,” he said. Antigua and Barbuda’s Kalique St. Jean who was second in the 2016 race, is returning. The 19 year-old said he’s looking for a personal best on Saturday. 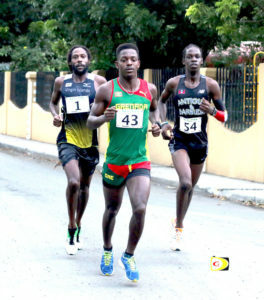 St. Thomas’ Shane DeGannes saw his 3-peat streak snapped in 2016 when he finished third behind Grenada’s Renon Raddix and St. Jean. In the Women’s Division, in her last outing in 2016, St. Thomas’ Ruth Ann David improved her own course record of 1 hour, 30 minutes and 46 seconds by 25 seconds when she stopped the clock at 1:30.21. Virgin Gorda’s Velma George who has been living in New York and held the BVI Marathon record between 1993 and 2016, will compete in her first road race in the territory. She’s coming off running in the New York City Marathon, which was the 21stoverall Marathon she has completed in her storied career. Current BVI Marathon record holder Anna Kinkead is also expected to toe the line on Saturday.